About a month ago, after only a few weeks on Second Life, I bought a home in a quiet corner of Colonia Nova. Then a few days ago I was unexpectedly presented with the opportunity to buy a small shop near my home. I jumped on the chance, although I have as yet absolutely nothing to sell, since I'm still learning to make basic plywood boxes. Economic activity is evidently a central part of the Second Life experience. Most landed residents have a shop or a business of some kind, in addition to their house – or in place of a house. It appears however that the wheeling and dealing of the majority of residents remains on the level of a game. Someone has said that if you calculated the average financial return on all of these virtual businesses, you would find that the owners could have earned a higher hourly rate by babysitting for their real life neighbours. There are exceptions, notably among the land barons, who purchase and develop large blocks of land, sometimes entire sims, and then rent out parcels. The most famous land baron is Anshe Chung, who made over a million real-life dollars from her in-world business. But for each successful merchant or land-baron, there are thousands of gifted creators producing marvellous content and gaining only a pittance from it (just as in real life). So I have no illusions, but I'm ready to play the game of developing my own virtual business. I therefore began looking through the blogs and websites to learn more about the virtual economy. As usual, a natural starting place for my research was Wikipedia, which has a long article about Second Life, as well as shorter articles on specific topics such as Second Life Real Estate. It has been suggested that this stability is fragile. The total value of Lindens in circulation is only partially backed by Linden Lab revenues in US Dollars, since Linden Lab steadily creates new Linden Dollars out of nothing, such as by providing new premium users with stipends. This fragility could lead to a recession, or even to outright economic collapse if people lose confidence in the stability of the exchange rate. Moreover, Linden Lab includes provisions in the Terms of Service which state that Linden Lab is not required to pay any compensation if Linden Dollars are lost from the database, which deprives Linden Dollars of intrinsic value as a form of currency. What I understand from all of this is that Linden Dollars are a truly virtual, rather than real-world, currency. Investing in them involves correspondingly high risk. The lack of true exchangeability with US dollars was demonstrated by an experiment described in an often-cited blog post by venture consultant Harrison Randolph. Working for a group of entrepreneurs and investors, Randolph sunk nearly $10,000 USD into Second Life over a 6 month period, borrowing from or lending to virtual banks, and entering into various types of virtual financial arrangements. Randolphe's first conclusion was that you can seldom trust those with whom you’re doing business in Second Life. Even supposedly well established business citizens are prone to defaulting on any obligations which prove inconvenient, since their real world identities are carefully-guarded anonymous secrets. Randolphe's second conclusion was that the L$ exchange process is more of an open auction than a true currency exchange market. The catch is that the announced stable rates only apply to small amounts, to the multitude of tiny transactions by small-time buyers and sellers going through the official LindeX exchange. As soon as you want to make a big trade, you must go through the private exchanges, which are owned by the businesses which sit at the top of the Second Life economic hierarchy. (The “Virtual Land Baroness” owns the largest such exchange). Every time Randolph tried to transact more than a couple hundred US dollars, the exchange rate would suddenly spike to levels of about 400 to 500 Lindens per USD. Because of this "rigged" exchange scheme, the end result of each of Randolph's deals was a net return of only around 4%, which was the prevailing interest rate on dollars deposited in a real world bank! He tried to figure out a way to disguise his trades, or to create his own in-game banks and exchanges in order to arbitrage the other direction, but found no solution. This led him to conclude that Second Life is a "pyramid scheme." As he notes, the buzz is that it is possible for enterprising residents to make big money in Second Life. The reality is that one of the more successful in-world business-persons that Randolphe spoke with made an impressive L$50,000 in one month of operation of her virtual jewelry store - which is only about $185 USD! A tiny handful of land barons and brothel owners are responsible for nearly all of the real money extracted from the game, and they profit from the mass of new recruits who invest in-world in the hopes of making big money themselves. Prokofy gained his economic expertise through the school of hard knocks, as an in-world business-person. He explains in a recent blog post that he got his start by advertising his rentals in an Anshe Chung shopping mall, located on the same sim where Prokofy's rentals were. And Prokofy still has tenants today. Thus when Prokofy pipes up to defend "small businesses" on Second Life, he knows by personal experience what their problems are. Of course Prokofy is in business in order to be able to mouth off, rather than mouthing off because he is in business, but the end result is the same. He knows what he is talking about. Prokofy is thus in a good position to inform us about the history of Second Life economic development. As he tells it, the whole story hinges around the introduction of the telehubs, which modelled the Second Life economy for a few years, before the Lindens changed tack and destroyed them. The telehubs were an artificial constraint on resident travel that was introduced to make residents socialize and build together. The Lindens got this idea from Jane Jacobs, who held in her classic "The Death and Life of Great American Cities" that New York grew and thrived because of rich accidental constraints that forced travellers and merchandise to go through it. Travelling Second Life residents were thus forced to teleport into the hubs and then fly out of them, which obliged them to congregate, if only briefly, before they rushed off somewhere else. The areas around the telehubs soon became ugly, laggy messes, obliging the Lindens in late 2004 to start redesigning some of them with green grass, trees and open spaces, in order to mitigate the mall lag and blight. But according to Prokofy, the telehubs were an enormous engine of growth and creativity for Second Life, precisely because of the capitalistic mall development. Entrepreneurs realised that this land was valuable, bid it way up on the auctions, and cornered the market. Thus Anshe Chung, Blue Burke, Moonshine Herbst and a few others made their fortune in mall rentals and machines. Anshe's malls were carefully master-planned, laid out to provide a maximum of rental space and an easy flow-through of avatars, and business boomed. Prokofy claims that: "The mall barons created a system that, ironically, was extremely democratic, accessible, and wealth-producing." Although mall rentals were very high per prim, anyone willing to pay the price could get a stall, whereas prior to that point the Second Life economy resembled a medieval apprentice system. You had to cultivate and flatter a member of the aristocracy of feted divas, in order to get a spot in the back of her store. Prokofy adds that under the mall system: "You could even make a deal with Anshe, if you were large enough, to put out your stores for you each time she managed to snag an auction win with a telehub in it." Did "small businessman" Prokofy successfully make such deals with Anshe? Would he in fact be sitting somewhere high on the Second Life pyramid, instead of down here with the rest of us, as he pretends? Prokofy waged a battle for keeping the telehubs, as did Gwyneth Llewelyn, though for different reasons. But all 42 telehubs were simultaneously deleted in late 2005 by the Lindens, who were under pressure from various lobbies to allow teleporting "P2P" (which on Second Life seems to mean Place to Place, rather than Person to Person). With the telehubs gone, some of the malls stayed as before. Traffic continued to come, but the lag was gone, since only those residents visited who specifically wanted to be there. What this story would seem to suggest, of course, is that the mall-managing land barons who climbed to the top of the pyramid during the telehub period, now form a permanently closed club. The "historical conditions" that allowed them to rise by grabbing the land around the telehubs are now definitively gone. One could always try to create a brilliant new set of themed sims, on the model for example of Desmond Shang's Caledon or Torin Golding's Roma, in the hopes of attracting enough renters to make a profit. But the sheer concentration of economic activity that resulted from the telehubs no longer exists anywhere on the grid. With the telehubs gone, the in-world economy has frozen into a form of oligarchy, which someone like Prokofy Neva has no reason to contest, however undemocratic it has become. There remain of course many ways to make real money from Second Life. The best bet is to provide consulting and content creation for real life businesses that want to establish an in-world presence. Since these businesses install their in-world presence only for purposes of marketing and publicity, the service-provider acts as a cross between an advertising agency and an architectural firm, with a dose of computer savvy thrown in. It is significant that such service-providers are wary of Linden Dollars. One of these companies recently indicated on their website that their services are billed in US Dollars, though this information has since been discretely removed from the site (hidden from the public eye and reserved for private response to serious client queries). In others words: please pay us for our real-life services in real-life money, rather than in Linden funny money. I still plan to create my in-world business. But the information summarized in this post indicates that my chances of making more than pocket money in-world are practically nil, especially since I'm unwilling to invest the significant amounts required to become a land baron. 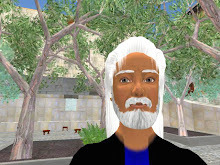 Second Life is however an incredible tool for learning about economics and entrepreneurship. A whole range of economic phenomena are modelled with surprising realism within the virtual world, to the extent that some people seem to have taken it for a real, rather than a virtual, economy. And although a tiny few at the top of the pyramid do extract real dollars from the system, the in-world business of most residents remains just a game. And this is how it should be. The proper employment of funny money is to use it to have fun. I see that you're a bit pessimistic on "launching a new business" in SL, or perhaps just realistic. There is an historical reason for the early landbarons to have risen to the top of the pyramid: in 2003, when they started, SL was tiny. Even when I joined SL, with its 12,000 registered accounts (almost all pretty much active), people blogged that SL was "so big that walking from one end to the other took about 3 days" (avatars walk at about the same speed as real humans, ie. 5-6 km/hour). Under such conditions, in a tiny place, it's easy to get an edge pretty soon. Almost everybody will have seen "most of SL". You'll at least have known all the "cool places" and could start launching your business there. As SL grew, the telehubs were indeed the aggregation points for new businesses to be launched. When LL removed them, SL was at a stage where the mainland was as big as all private islands put together, so the natural change for commercial activities was to move to the private islands (which might be, after all, what LL had in mind...). Today, the mainland is perhaps about 20-25% of the total landmass. The rest is a plethora of unconnected islands. So how can you start your business in SL and be successful? In my RL lectures I tend to use the metaphor of the person who just bought a tiny restaurant up in the Highlands, on a village with a few dozen inhabitants. You remodel your restaurant and now face the population of the whole world, which is these days bigger than New York City or countries like Portugal, Austria, or Sweden, and will very likely surpass Australia by the end of 2008. How can your tiny restaurant, up in the mountains, address patrons that come from all over the place? The answer is, of course, you can't. Just like in RL, you cannot expect that just because you have done a good deal and bought your shop somewhere, you're now going to get enough customers "because you exist". You need to seriously advertise your business to be able to slowly crawl up to the top. And that's way more costly in 2008 than it was on the tiny world of 2003 when "everybody knew everybody else". So it's obvious that the 2003 landbarons will obviously have a huge lead on the rest of us. Anshe is widely known, she was on the cover of Time magazine, but these days Azure Islands have a larger landmass than Dreamland. Even "newcomers" like Prokofy or Desmond's Caledon boast at least a thousand customers each. But they're "less known" (at least as land barons). But there are several avenues for being successful — it depends on how mature your business model is. Three examples come to mind, one of which, sadly, will be gone by January 22. The first is fashion. Fashion has its own culture, its own blogs (more than any other area! ), its own critics and newspapers, its own venues, contacts, and networks. People like Ana Lutetia came to SL only in 2007, established themselves as one of the major fashion setters in SL (after being a successful model), and is now one of the top references in the fashion world — no one starting their business is able to ignore her if they wish to be widely known. And she constantly introduces new, talented designers to the fashion subculture in SL. In effect, she creates this huge floating sign on top of the restaurant up in the hills and says: "This is the place to shop for clothes". And thus a new brand gets launched and quickly becomes as widely known as the ones back in 2003. The last one is finance. Similar to fashion, they have their own blogosphere, magazines, and venues. All "bankers" used to know and invest in each other; they generated together enough PR and media splash to create a whole subculture around SL's financial world. There is a "Wall Street" for SL (even if it is not a single place, but scattered around the world) where everybody knows everybody else — and even newcomers are widely announced. Sadly, as said, LL is throwing this subculture out of SL. There are also good runner-ups, however. The art scene in SL was a bit unorganised, with too many amateurs in 2004/5 who were simply clueless and had no idea on how the artists in RL network — gallery owners, curators, critics, museums, and conferences, none of these things existed back then. Now they're fully organised — perhaps not at the scale of the fashion and financial world, but they're getting there. Be part of the network, and even tiny museums like the Neufreistadt Museum of Contemporary Art gets into the "important to visit" lists pretty quickly and become a hotspot for the artistic movement in SL. A subset of that group which has a huge mainstream support are the live musicians. Although not so organised overall — they have no "reference website" or a focus point for their work. Still, their agents roam the grid in search of venues for offering their live shows. They're pretty organised, even if not at the level of the other artistic groups. And there are also the lawyer groups — some of them, like Benjamin Duranske or Jessica Holyoke or even Ashcroft Burnham, have escaped out of the closely-knit legal subculture and come into the mainstream with their opinions and thoughts. They are less organised yet, but getting there quickly — they're natural networkers, from a professional point of view, and band together quickly. They are also incredibly argumentative :) and this might explain why their "subculture" is not so tightly-knit (yet...) as the others. And finally, there are the sustentability groups — promoting eco-friendly solutions in SL. They also run their own loose organisation, exchange contacts, and arrange conference and exhibition spaces for each other, starting from a network of "core sims" that serve as the focus for their work. So what does this all mean? In a few areas, networking will give you good chances of success, even if you're just starting "with a tiny shop". There is good reason why one of the most popular jobs in SL is fashion design (at least, beyond the mature jobs). They know that if their tiny shop grabs the attention of one of the fashion critics, they'll be "in the loop" pretty quickly, even if they're complete newbies. SL is a strange place, sure, but it works like the real world — networking is one of the most important things to get yourself established. Advertising — and these days it means expending a lot! — will also have an impact, but it's harder. Rezzable, for instance, are relying much more on advertising on all possible blogs and websites in SL, and getting good PR on them too, than on networking — and they're being successful that way too. Danton, you have to study SL history and economics way more than you have, and avoid making facile and erroneous statements to the effect that there is now an "oligarchy" that is closed with everyone frozen out, and that Prokofy is somehow suspected of being at the top of this heap, and that I have no reason to protest it -- all false premises and conclusions. Second Life is conceived of a pyramid even by its makers, with 10 percent or so at the top making the content for the other 90 percent. If you include "content" rearranging the content of others (houses, landscaping) and providing services (rentals) then perahsp it's 15-20 percent, but most are consumers. This small percentage of active prosumers, if you will, in relation to Linden Lab, are divided roughly into content creators -- designers, programmers, scripters, builders, animators, etc. -- and land barons. You're completely forgetting that the land barons, while famous for having Anshe Chung supposedly making a real-life million, are collectively, much lower wage-earners than the content creators. Read the press from 2003-2005 and you'll find figures like Craig Altman, Owen Khan, Cristiano Midnight who made RL fortunes of $50,000 US or more in animations. Then there are dress designers like Simone who told the Washington Post she made about $60,000 US last year. This is a small grouping of perhaps a few thousand at most, but these people are all making authentic living wages even by New York standards. Land barons, however, have to work way more hours doing customer service, and have far greater costs (tier, prefabs, etc). Those who do best are those like Desmond Shang who have their own building and scripting skills to add to their business without having to hire others. On this pyramid, I'm quite low down -- any island dealer with 20-30 islands probably makes double what I do, because islands simply sell better and are more fully occupied. I can easily lose half a month's income from 2 weeks of solid griefing driving customers out of 4 of my sims -- that never happens to islands. I'm the largest mainland rentals agent just because I have a lot of customers, around 1300-1500 or so I think now, but these range from $25 stalls to lowly $150 newbie cabins in Lindens, not the $25 and $40 *US* per parcel that Desmond can gain, or many others with more holdings than he, i.e. D'alliez. I'm not in any oligarchy in SL, because on the mainland, your income is more sparse, and I plough some of my income back into supporting newbie communities and the SL Public Land Preserve. So your conclusions are way off. Gambling, casinos, banks, prostitution -- these businesses were all coining money too, far more than anything I'd even approximate. What can be said about all these businesses in SL is that except for a few of these high-end designers, most people, including myself, cannot be said to be billing for our hours. If we did, we'd break even or lose. What happened as the telehubs began to fold were several other events, also largely driven by Anshe which I should write in more detail on my own blog some day, but these included the summer/fall 2005 cornering of beachfront property, which she jacked up to a very high price not so much to sell it, but to make the sticker shock drive people to her burgeoning island collection. So she cornered the market, but then put portals on each parcel which when touched, pulled up a map and brought you to Dreamland, where you could find less laggy and blighty land in zone d areas. Both Anshe and Desmond and others actively played on the fears of sign extortion, begun by the "Bush Guy" in 2005, which drove many to the islands. Some of the ad extortion was done by alts or even mains of those selling island villas, to help force people off the mainland to more high-priced private islands. Meanwhile, clubs took the place left void by most of the telehubs (some telehubs persisted, like Ross and even Brownlee, but most died). Clubs increasingly used camping schemes to get eyeballs which they dragged in front of numerous vendors of clothing and attachments, and thus turned the clubs into malls. Some clubs became wall-to-wall vendors with zombies and slot machines. For me, it wasn't very beneficial to have offices in Anshe's mall -- the point was merely to gain visibility. I had 3 offices on 3 of her telehub malls, and they hardly produced any sales, but they helped create logo familiarity like an ad and helped people see in the Anshe context that there was an alternative rentals company that specialized in mainland and in providing prefabs to people for free. Anshe got out of the mainland land rental business very early, it wasn't worth her time, she moved to islands after 2 planned communities on the mainland failed due to griefing and blight on the edges and lack of sufficient sales. I disagree that there is no place to open up a business anymore in SL. While Americans are wringing their hands and whining, Brazilians and Dutch and Russians are streaming in and opening up competing rental, services, widget businesses all over. They lowered the prices to compete and added better service -- the mistake certain Americans, Australians, British did among the early adapters is over-script everything -- which means the scripts broke on Linden patches and poor performance and exasperated people who couldn't reach no-show landlords or vendors when payments failed. The people who do the best are those who log on and stand behind their store counter day and night with the "we dose but never close" and "time to lean, time to clean" mentality that created the successful early General Stores and then the franchised 7-11s all over America. Content creators are making money from prefabs, furniture, animations, clothing, inventions to do various things (these are really amazing when you study them on sites like Slexchange.com). As a real life product designer, I have seen a very common malady in SL that does not exist in RL because the cost of producting a useless product in RL prohibits much of the schlock that we see being purveyed in SL where the cost is next to nothing. If you want a successful business in SL, do some market research, hang out a while and look for a REAL need among the inhabitants, create your product and test it thoroughly. Debug it till you are sick of it! Make sure it really does what you want it to do and beta test it with friends. Listen to them carefully - if they don't care about your product, no one else will either. In short, you cannot shortcut the path to creating wealth if you want to have wealth. Solutions to non-problems are not worth anything to anyone except as a curiosity, which don't pay a plug Linden. Product design in SL is no less work than in RL. It took me several months to release my first product - to make it perfect and useful and it has been worth every minute of that effort as a steady stream of income. Real solutions to real problems will always be worth paying for.